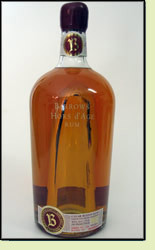 Andy: Barrows has an interesting bottle. It’s kind of phallic because it has a cylinder in the middle where they used to put cigars. After trying it, it is absolutely DISGUSTING. It has a very empty flavor. It is smooth, but it really has no taste, almost like a dry light rum. It actually has a little bitterness and it is still nasty mixed with Coke Zero. At over $30 a bottle, it is WAY overpriced. It could be half price and I wouldn’t buy it. I would definitely avoid this rum. Adrian: I give this rum points for being over-proof. If you like a dry wine, you might like this rum, but I don’t. It is very dry and I’m not a fan. I would definitely not buy this.